Hi guys… I went to bed thinking about this problem, again… and you know… there’s nothing we can do. … the barbarians win. Nothing more can be done. … It’s like writing a political blog; people who agree with you will read it. Those opposed, or those who don’t care, will not read it. Troll… that’s what’s left… vigilante operations… but who wants to get into an internet-wide profanity-match… ? … the barbarians would win it, anyway. The truth is: If you share something online with anybody, it’s gone. You like to feel you have rights… but it’s gone. 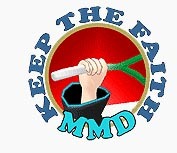 MMDers who recognize their obligations will Keep the Faith. … Those who do not, will not. I believe in the artist’s right to own his creations and appreciate that he shares it with us… but… that’s just me. After reading this I think I’m going to not bother to learn MMD and just stick with my current modding community. This is all a bit polarizing and immature for a polygonal doll moving engine. What part of it is immature, if I may ask? Every community has its own set of rule. MMD community may operate differently from other 3D community, but asking for people to respect your work is not immature at all. Especially the MMD model makers. They put a lot of hours to produce models to be used by MMDC world-wide. If they asked something as simple as “credit me” or “don’t use for this and that”, it’s their right to do so. They deserve the recognition for what they have done. They also deserve the right to set the rule about their creation’s usage since, well, they don’t want to see their creations be used for things they can’t agree on. I am not by any means a professional MMD modeler myself, but regardless I still put some rules on what little of my creations that actually went public. Because I don’t ever want to see my models actually used for R-18 or propaganda purposes. Is that an effective way to control the community? Heck, no! Like the article said, when you put something on the internet, you lose all control over it. They can do whatever they like with what they downloaded. However, MMD originates from Japan, and in its growth adopted much of the Eastern values into its community before opening the door to the West. In case you haven’t noticed, there’s quite a big amount of difference in their values. The laid-back West against the rather strict East. The clash (of ideals) is unavoidable. You came from a modding community, which is probably more loose in terms of rules of “faith in community” than us. That’s understandable. You might also get turned-off from MMD due to our constant barking on these “rules”, that’s also perfectly understandable. But moral values are different across the globe, and it’s MMDC’s, no, humanity’s job to respect each other. Gaining recognition and setting up rules for something you made is not immature at all, but disrespecting someone else’s rights is even worse than acting immature. We’re not promoting immaturity, we’re promoting cross-cultural understanding in a way. Since unification of ideals is not the way to promote peace (within community), but rather, it’s the respect and tolerance towards each other. Why is more people using a model than less people using a model a bad thing? You’re advocating prejudice by calling them barbarians. Rights are nothing without the ability to be enforced. However, everyone loses when those who receive are taught not to give. It’s not about not using models. It’s about not using models in a way that disrespects their creators. As for why it’s bad… apart from moral issues, it’s simple utilitarian logic. Premise A: Creators that feel abused by their models’ inappropriate use and/or lack of recognition are likely to slam the door at the community and cease to work in MMD, sometimes pulling down their previous works as well. Regardless of whether you consider such behavior justified or childish and immature, you have to deal with consequences all the same: no more models from a particular author, and sometimes even less. (On a personal note: whoever caused Pandakaii to close his dA account and make his Wheatley unavailable, burn in hell). Premise B: Model makers are a higher caste in MMD hierarchy. You may not like it, you may consider it unnecessarily high-brow, but the truth is this simple: creating a good model requires significantly different and more sophisticate set of skills than creating a video with a premade model, and as a consequence, model makers are significantly less numerous. Models are downloaded by hundreds, but created by singles. Conclusion: The net loss that the MMD community suffers from predatious usage of resources overweighs the net profit created by members of that particular uncaring subset (who also statistically tend to be on newbie side of the pool and therefore their input has lesser value than of those who have more MMD experience *and* more wits to respect those they take from). I am all for more people using more models… but civility requires that MMDers write credits to identify/acknowledge the model and it’s maker. … and MMDers must read the ReadMe file included with the model (translate it from Japanese if you need to) and adhere to the requests made there by the model creator. Those who ignore these basic rules are the ones I am calling “barbarians”. So, YES: use models… and YES: include credits… and YES: adhere to creator’s requests/restrictions. What’s worse than people stealing your work is expecting them NOT to, then letting it ruin you when they do. It’s the internet, if it’s possible, someone will do it. The important thing is to not let it ruin you, or what you do, or whatever community you’re in. Plan for it and make it as obvious as possible that the plagiarizers are rude, uncaring heartless human beings. Personally, I’d rather my stuff was out there enough for people to steal it, and for more people to see it that way even if they don’t know it’s me who made it, and ALSO have a nice, loving, supportive community of fans behind me, than to be so unpopular no one steals my work. Thank you for that… Yup… Expect anything you put out onto the web to go out of your control. It’s nice when users are respectful… but the barbarians are out there, too.